Most WSOP gold bracelet winners would be thinking about using some of their winnings to enter more tournaments. Brandon Paster, on the other hand, is more worried about ensuring that he makes it to the Electric Daisy Carnival music festival on time. “I’m gonna party my face off,” he said after topping a 967-player field in a $1,500 Pot-Limit Omaha event. “There is no better way to celebrate a bracelet than EDC.” Paster will have plenty of money to party his face off with too since he collected $264,400 for winning Event #37. Aside from going to EDC, Paster will be skipping the 2014 Main Event so that he can embark on a three-week long road trip across the United States and also live in Amsterdam for a month. While in the Netherlands, perhaps he can visit Dutch poker pro and fellow bracelet winner Marcel Vonk, who finished second in this tournament ($163,625). George Danzer was probably starting to feel like he’d never win a gold bracelet after missing out on one during six previous WSOP final tables. However, he broke this streak by winning the Event #18 $10k Razz Championship and $294,792 a few weeks ago. Now Danzer is a multi-bracelet winner after capturing the $10k Seven Card Stud Hi/Lo title along with $352,696. The German poker pro survived a very tough 134-player field. The final table featured notable pros like David Singer (7th, $41,277), Jeff Lisandro (5th, $61,594), Brian Hastings (4th, $77,238), Calvin Anderson (3rd, $98,828) and John Racener (2nd, $217,935). So as you can see, Danzer had his work cut out on the road to becoming the first multi-bracelet winner of the 2014 WSOP. Thanks to this Event #38 victory, he takes a commanding lead in the Player of the Year standings. Currently, Danzer has 726 points on the strength of two bracelet wins and two more final table appearances. Meanwhile, Brandon Shack-Harris remains a distance second place at 474 points while Justin Bonomo sits in third with 413.63 points. Before the 2014 WSOP, Sean Dempsey’s main claim to fame was that he taught Tom Dwan how to play Pot Limit Omaha. But now, Dempsey can boast of winning a gold bracelet after taking down the Event #39 $3,000 NL Hold’em tournament along with $548,460. 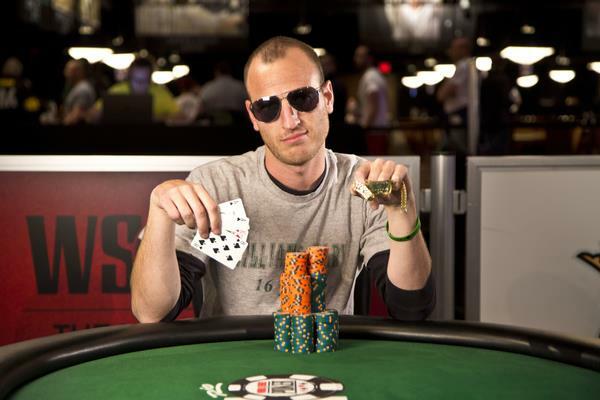 The little-known poker pro beat out a field of 992 players to earn his first bracelet. This victory was definitely sweet for Dempsey too because he’s been trying to win a WSOP event for the past 10 years. It required surviving a three-hour head-up battle with Ryan Jaconetti ($339,440) to win Event #39, but Dempsey’s poker experience helped him outlast Jaconetti and accomplish his dream.